We hope your new year is off to a wonderful start! 2018 was a great year for innovation and education in the FR clothing industry. We’ve gone through our blog and highlighted some picks just for you. 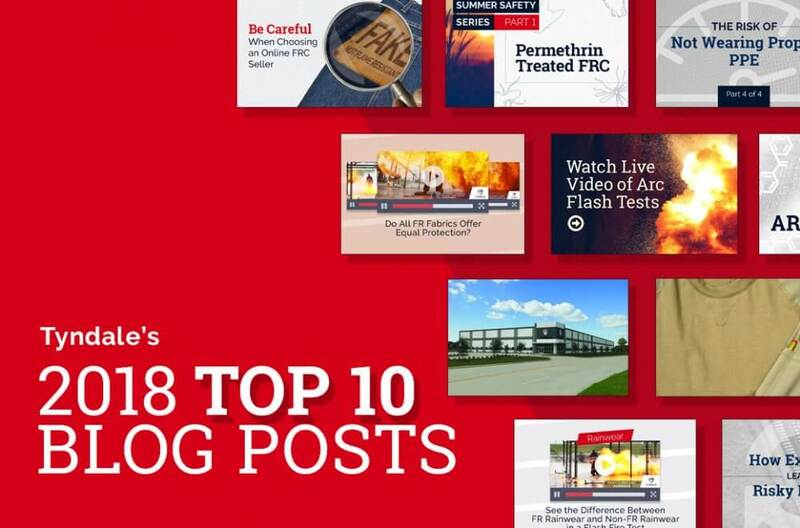 Here’s a look back at our top-10 posts from 2018. Tyndale’s event recap Witness the Power of an Arc Flash dominated our 2018 blog posts. Tyndale, in cooperation with Westex by Milliken, held an educational event to demonstrate the dangers of a substantial arc flash. Guests attended educational seminars, then witnessed a series of arc flash demonstrations, testing a wide variety of FR and non-FR garments. Don’t worry if you missed it, you can now watch the videos of the arc tests for yourself. Over-confidence in your abilities can lead to risky behavior on the jobsite. When you’ve performed a task repeatedly without incident, you might pay less attention to the safety risks Hear from an arc flash survivor who outlines the factors that contributed to his arc flash incident. 3) What is Aramid Yarn? If you buy and wear FR clothing, chances are you’ve seen references to Aramids being used to make some FRC. Let us explain what an Aramid is and what makes Aramids a great fit for use in FR clothing. Has this happened to you? You were asked to relocate a cord inside of a panel – something you’ve done countless times – it’s late in the day, you’re rushing to finish the task, and you’re not wearing your proper PPE gear. This is a perfect scenario for disaster, one that almost cost one survivor his life. Let him explain why proper PPE gear is so important on the jobsite. 5) Houston, We Have Liftoff! Tyndale’s new Houston Distribution Center is open for business! Tyndale CEO, Gail Whittenberger and Houston Director of Distribution, Fernando Duran shared the honors of cutting the ribbon and declaring the new location open for business. Room for more inventory and a streamlined distribution process helps insure a better user experience. 6) Do All FR Fabrics Offer Equal Protection? The verdict is clear, wearing non-FR clothing when a flash fire occurs can lead to catastrophic injury, or even death. But are all FR fabrics created equal? See for yourself in our video series where we tested a wide range of FR clothing options. Summer is a great time of the year to be outside, but with the warmer weather comes disease carrying insects. Unfortunately, popular insect repellents – like DEET – are not recommended with FR clothing. Did you know Tyndale offers an exclusive line of FRMC® garments with durable Perimeter Insect Guard™ to protect you on the jobsite? Educate yourself on the benefits of our peremethrin-treated FR clothing. Although staying safe while dressing comfortably can be a challenge, safety and comfort can go hand in hand. Tyndale has introduced The Versa Long Sleeve Raglan T-Shirt. It’s modern, comfortable, and most importantly, able to provide the protection you need to work safely. Erase the boundaries between work clothes and the rest of your life – choose Versa! Earlier this year, Tyndale hosted a flash fire demonstration testing a range of FR rainwear garments. Check out these videos to see how each of them performed during a short duration thermal exposure! 10) Buyer Beware! Could Your FRC Be Counterfeit? We have noticed a growing and alarming trend in recent months. Certain disreputable online merchants are selling counterfeit “FR clothing” at extremely low prices. Not surprisingly, these deals are too good to be true. See the shocking protective difference between real and counterfeit and gain the knowledge needed to spot the imposters. Some stories are created simply to make you feel good! When building our new distribution center in Houston the construction team found two stray dogs living at the worksite. The pair, a 9 week old female puppy and 1 ½ year old male, were in poor health, but were bonded and would not leave each other’s side. After efforts to find a no-kill shelter failed, Tyndale’s Manager of Retail Operations, Wade Whittenberger, adopted the two strays and brought them to his home in Pennsylvania.